1. The Mansion: This is where Romana, Sebastian, and Lumina live. Romana is the owner of this mansion, which is apparently built in a crevice in the valley. Its three environs lead a relatively quiet life. 2. Private homes: This place chages a bit during the course of the game. In chapter 1, this home belongs to Galen and Nina. In chapter two, Dr.Hardy moves in here, and turns the house into a clinic. There's another home that first appears in chapter two. Grant, Samantha, and Kate live here. There is a third home that is there from the beginning, and never changes ownership. It is where Wally, Chris, and Hugh live. 3. Mitemi Inn: The inn run by Tum, his wife Rruby, and their son Rock. Nami stays here, too, in aroom on the second floor. 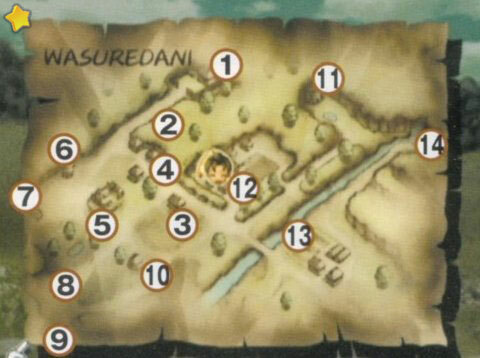 However, Nami has a very random schedule: she's out wandering around more than she's here. 4.The Blue Bar: This bar is run by Griffin and Muffy. Lots of people gather here all day long, so it's a good idea to come frequently. You're bound to make some good friends! 5. The Scientist's House: Forget-me-not Valley's local mad scientist-type of guy, Daryl, lives here. Dariru is always trying to make new things, so the area around his house is always a bit cluttered. 7. Artisian: Scary-looking Cody, an aspiring artist, lives here. 8. Turtle Swamp: This is a tiny marsh, and the turtle's favorite spot. You can also do some really good fishing here! 9. The Beach: ...Somehow, this valley is located near the ocean (isn't Mineral Town, too?) You'll often see people going for walks along the seashore. 10. The Minsteral's House: This is Gustafa's hut. However, you'll rarely see him at home. He's usually out playing his lute for people and animals! 12. Your Farm! : This is your home, the farm that you run. You have a house, a barn, 3 small fields, a chicken coop, and all sorts of stuff. It's a big place compared with most other areas in the valley. 13. The Plantation: A farm right next to yours. Vesta, Marlin, and Celia live here. You can buy seeds and get advice from here. 14. The Ruins: Near the waterfall lives Carter, and archeologist, and his assistant, Flora. They are studying the ruins, looking for various objects.